To explore the history of the Warriors franchise is to explore the history of professional basketball. From their inception in 1946 as the Philadelphia Warriors in the Basketball Association of America (which became the NBA in 1949) to the disjointed Nelleyball era of today, there has not been a professional basketball season in this country for which the Warriors have not been present. Over the past six decades, ten Hall-of-Famers- Wilt Chamberlain, Paul Arizin, Rick Barry, Nate Thurmond, Neil Johnston, Joe Fulks, Robert Parish, Tom Gola, Jerry Lucas and Andy Phillip- have suit up in at least 100 games for the Warriors. An eleventh, Chris Mullin, is a safe bet to join this group in the near future. The Philadelphia Warriors won the first-ever professional basketball championship following the 1946-47 season, and the franchise has since gone on to win two more titles (1955-56 and 1974-75), reach the Finals on five other occasions and author one of the greatest-ever postseason upsets. It was with the Warriors that Wilt Chamberlain hit his statistical peak (that’s saying something!). It was with the Warriors that Rick Barry was essentially Larry Bird before Larry Bird. It was also with the Warriors that Chris Mullin introduced us to the prettiest lefty jumper in history. However, as accomplished as the Philadelphia/Bay Area Warriors franchise is, it’s interesting to note just how often this team’s been, well, not very good. The Warriors have failed to post a regular season record of .500+ in 34 of 64 seasons. The Warriors have made 29 postseason appearances- six straight from 1946-47 through 1951-52, but no more than three in a row (done five times) since. Meanwhile, the franchise has missed the playoffs in three or more consecutive seasons four times- one of the streaks a nine-year drought from 1977-78- 1985-86, another spanning a dozen years, from 1994-95 through 2005-06. Other than in 2007, during which they produced an epic first round upset of the heavily-favored Mavericks, the Warriors have been playoff outsiders for 16 years. It’s surprising to realize that a franchise that’s enjoyed so much success and notoriety has also suffered from such extended periods of futility and an utter lack of consistency. It was also with the Warriors that “Run TMC” lit up the early 1990s, with Tim Hardaway and his “UTEP Two-Step” leading the way. 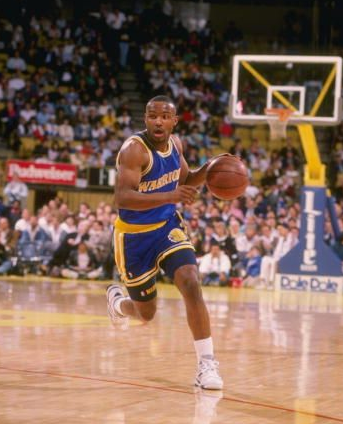 In five full seasons quarterbacking the Warriors’ attack, Hardaway never averaged fewer than 8.7 apg and twice averaged double-figures, including a career-high 10.6 in 1992-93. Hardaway was one of the most prolific scorers among NBA PGs, averaging 20+ ppg four times, posting the three best scoring seasons of his career (22.9, 23.4 and 21.5 ppg) from 1990-91- 1992-93. He earned an All-Star selection each season, and was selected All-NBA Second Team in 1991-92 and All-NBA Third Team in 1992-93. The only full season with the Warriors during which he failed to score 20+ was his rookie year (1989-90), when he averaged 14.7 ppg, dished out 8.7 apg and was named to the All-Rookie First Team. In five seasons, Hardaway led three playoff appearances. 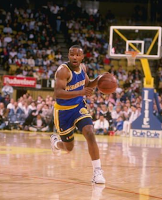 Hardaway was outstanding during a trip to the second round in 1991, averaging 25.2 ppg, 11.2 apg and 3.1 spg in nine games as the Warriors bounced the Spurs before falling to the eventual conference champion Lakers. In five years in Oakland, Hardaway developed into a perennial All-Star and one of the most exciting and explosive lead guards of his era. In terms of stats, accolades and pure excitement, there’s not a Warriors’ PG that can top Tim Hardaway. Starring for the Philadelphia (and later San Francisco) Warriors in the late 1950s and 1960s, Guy Rodgers (1935–2001) is a deserving second-place finisher here. In 587 games over eight seasons, Rogers was one of the best lead guards of his era. As a scorer, Rogers was solid, averaging double figures in seven of eight seasons, including a career-high 18.6 ppg in 1965-66. This was the only time he averaged better than 14.6 ppg with the Warriors. With the Warriors, Rogers averaged 12.8 ppg, 5.1 rpg and 8.3 apg, was named an All-Star three times and placed in the top two in the NBA in assists six times, leading the league in 1962-63 with 10.4 apg. Rodgers played alongside Wilt Chamberlain from 1959 through 1964, collected 20 assists during Wilt's legendary 100-point game and later that same season, tied Bob Cousy's single-game record of 28 assists- a mark that stood for another decade and a half. Also deserving a mention here is Baron Davis, who played a vital role in the incredible upset of the 62-win Dallas Mavericks in the opening round of the 2007 playoffs. In the Warriors’ four victories, Baron averaged 27.5 ppg, 8.5 rpg and 5.8 apg. His 33-point, 14-rebound, 8-assist Game 1 in Dallas is one of the best playoff performances of the post-Jordan era. In 227 games over 3+ seasons in Oakland, Baron Davis averaged 20.1 ppg (best among PGs in franchise history), 8.1 apg, 2 spg and was a driving force behind the only playoff appearance since Run TMC. However, Davis was neither named an All-Star nor selected to an All-NBA team as a member of the Warriors, and only managed to suit up in more than 63 games once- when he played in all 82 regular season games in his contract year of 2007-08. Despite excellent averages and the magical moments of the 2007 postseason, Baron simply didn’t accomplish enough or stay on the floor often enough to earn this spot. No shortage of talent here. Three outstanding seasons from a young Mitch Richmond, half a dozen strong all-around seasons from Hall-of-Famer Tom Gola and nearly a decade of solid, at times excellent, play from Jeff Mullins. Based on statistical achievement, longevity with the franchise and contribution to a championship team, Jeff Mullins earns the title of Warriors’ all-time two-guard. After starring at Duke and winning a gold medal at the 1964 Olympics, Mullins was selected sixth overall by the St. Louis Hawks in the 1964 draft. After a pair of unremarkable seasons (5.4 ppg, 2 rpg in limited minutes), he was drafted by the Chicago Bulls in the 1966 expansion draft, and immediately shipped to the San Francisco Warriors in exchange for PG Guy Rogers. Following his move to the Warriors, Mullins blossomed into a consistent scoring threat and a solid rebounder. He played nine full seasons with the Warriors, eight of which saw him make considerable contributions. Mullins scored at least 13.2 ppg in each of his first eight seasons in the Bay Area, and regularly grabbed 5+ rpg and dished out 4+ apg. By his second season with the team, Mullins was a legitimate offensive weapon, and would go on to enjoy a four-year prime in which he averaged at least 20.8 ppg was selected to three consecutive NBA All-Star teams (1969- 1971). Mullins helped the Warriors to six playoff appearances in his first eight years, and eight in ten total seasons- one of the franchise’s best stretches. He played a huge role in helping the Warriors reach the 1967 Finals, averaging 17.7 ppg and 6.1 rpg in 15 postseason games. Mullins was also a member of the franchise’s last title winner in 1974-75. However, by this point, Mullins’ skills had begun to erode. He played in 66 regular season games and averaged just 8.2 ppg in 17 minutes. He was able to maintain his production into the postseason, giving the Warriors 8 ppg in nearly 20 minutes per game en route to the championship. Mullins still ranks third in franchise history in games played (714), fourth in assists (2,913) and sixth in points (12,547). Among backcourt players, he tops the list in games played and points (only Warriors guard with 10,000+), ranks second in rebounds (3,256) and third in assists, though he’s first among shooting guards. As previously mentioned, the only Hall-of-Famer from this group is Tom Gola, a rugged two-guard from the 1950s and 1960s and one of the league’s original “glue guys.” His rebounding, passing and tough defense, along with a respectable offensive game, helped the Warriors to a championship in 1955-56. During the title run Gola, a 23 year-old rookie, averaged 12.3 ppg, 10.1 rpg and 5.8 apg. In 39 career postseason games with the Warriors, Gola averaged 11.1 ppg, 10 rpg and 4.6 apg. After sitting out the 1956-57 season, Gola returned to the Warriors for another five years, during which he averaged at least 13.7 ppg and 9.4 rpg each season. For three straight years (1957-58- 1959-60), Gola averaged a double-double (13.8- 10.8, 14.1- 11.1 and 15- 10.4), was named an All-Star in each of his last three seasons with the franchise and earned a place on the All-NBA Second Team in 1958. In 400 games with the Warriors, Gola averaged 13.6 ppg, 10.1 rpg and 5 apg. Finally, there’s Mitch Richmond, drafted fifth overall in the 1988 draft by the Warriors, who started his career with three very productive seasons in Oakland. As a rookie in 1988-89, Richmond averaged 22 ppg, 5.9 rpg, 4.1 apg and was named Rookie of the Year. Over the next two seasons, playing alongside Chris Mullin and a young Tim Hardaway, Richmond was a key component of "Run TMC." Richmond was an awesome all-round scorer with the Warriors, thanks not only to the great outside shooting for which he’d become well known, but also on the break. In his two seasons playing alongside Tim Hardaway, Richmond was good for 23 ppg and 5.3 rpg. After three years and 234 games with the Warriors, during which he averaged 22.7 ppg and 5.5 rpg, Richmond was traded to the Sacramento Kings prior to the 1991–92 season in exchange for Billy Owens. This spot in stacked. “Warriors’ small forward” boasts as talented and accomplished a trio as you’re likely to find in any position in NBA history. Three excellent all-around players, two of them champions, a member of the original Dream Team and a pair of (soon to be three) Hall-of-Famers. As strong as the competition was here, this spot belongs to Rick Barry, and by some margin. It’s tough to keep Barry out of any ranking of the top 15 players in league history. In his first five seasons with the franchise, he failed to average 25+ ppg and 6.8 rpg just once. In 1965-66, Barry produced one of the best rookie seasons ever, when he averaged 25.7 ppg and 10.6 rpg, won Rookie of the Year, was named an All-Star and All-NBA First Team. He had a pair of 30+ ppg, seasons, including a ridiculous second year, during which he averaged 35.6 ppg and 9.2 rpg, was named an All-Star, scored 38 points to win All-Star MVP and earned a second straight All-NBA First Team selection. Barry spent five prime years of his Warriors run not playing for the Warriors- he sat out 1967-68 and played four seasons in the ABA. During that stretch, he averaged (ppg- rpg) 34- 9.4, 27.7- 7, 29.4- 6.8 and 31.5- 7.5, and was named to four straight ABA All-Star teams. Not bad. 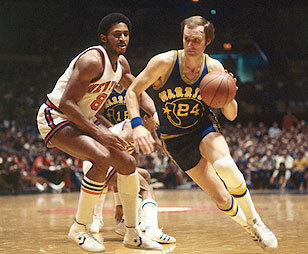 After returning to the NBA for the 1972-73 season, at age 28, Barry was good for at least 21- 5.5- 4.9 in each of six seasons with the Warriors, and was named an All-Star. Barry was also a phenomenal postseason performer, putting up 24 ppg and 5.5 rpg in four of five playoff runs (he had a 16.4 ppg 39.6% FG stinker in 1972-73) with the Warriors, including 28.2 ppg, 5.5 rpg and 6.1 apg in leading the Warriors to the 1974-75 title. Also, each of his five postseasons with the franchise consisted of at least 10 games- not a lot of first-round exits there. In terms of talent and resume, Rick Barry is as good as there’s ever been at his position. Too bad his legacy’s been somewhat obscured by the era in which he played (a down period for the NBA) and his abrasive personality. A pair of extremely honorable mentions are in order for second- and third-place finishers (in no particular order), “Pitchin Paul” Arizin and Chris Mullin. Arizin (1928– 2006) spent the entirety of his NBA career with the Philadelphia Warriors, and helped lead the franchise to its second championship in 1955-56. During the Warriors’ 10-game playoff run, Arizin averaged 28.9 ppg and grabbed 8.4 rpg. In ten seasons from 1950 to 1962- he sat out two seasons due to military service during the Korean War- Arizin played 713 games and averaged 22.8 ppg and 8.6 rpg, He won the NBA scoring title twice during his career, in 1951-52 (25.4 ppg) and again in 1956-57 (25.6 ppg). At the time of his retirement, Arizin held the NBA’s third highest career point total (16,266). That total is now good for third in Warriors’ history, behind Wilt Chamberlain and Barry. Arizin was named an All-Star in each of his ten seasons, winning the game’s MVP in 1952. He also earned three All-NBA First Team selections, one Second Team nod, was inducted into the Hall of Fame in 1978 and was named one of the NBA’s 50 Greatest Players in 1996. Finally, we have Chris Mullin, the face of the Warriors franchise over the past three decades and one of the best scorers of his era. Mullin was deemed worthy of selection to the original Dream Team and is the owner of as effective and beautiful a jump shot as the NBA’s ever seen. Mullin spent his first three seasons as little more than a spot-up threat. While he was establishing himself as a decent scorer (14, 15.1 and 20.2 ppg), the 1984 Olympian and 1985 NCAA Player of the Year and Wooden Award winner was not coming close to maximizing his potential, due in no small part to struggles with alcohol. In 1988-89, his fourth NBA season, the first year of the first Don Nelson era in Oakland- and Mullin’s first post-alcohol- he put up the best season of his career. That season, Mullin averaged career-highs of 26.5 ppg, 5.9 rpg and 5.1 apg, as well as 2.2 spg. This was good enough to earn him the first of his five All-Star selections. Mullin’s prime lasted another four seasons (1989-90- 1992-93). During that stretch, also known as the “Run TMC” years, he was as consistent as any NBA star, averaging between 25.1 and 25.9 ppg, between 5 and 5.9 rpg and between 3.5 and 4.1 apg. This earned him another four All-Star selections and his only All-NBA First Team nod in 1992-93, when he posted a 25.3- 5.6- 3.5 and 2. 2 spg. He was selected All-NBA Second Team in 1988-89 and 1990-91. When he averaged 25.9 ppg in 1992-93, Mullin joined Wilt Chamberlain as the only Warriors’ players ever to average 25+ ppg in five consecutive seasons. The 1994 breakup of Run TMC signaled not only the end of a spectacular era for the franchise, but the of Mullin's prime. He spent another four years with the Warriors as a double-figure scorer, sharpshooter and solid all-around player, but never returned to the form of his prime years. In 13 seasons with the Warriors, Mullin averaged 20.1 ppg, 4.4 rpg, 3.9 apg and 1.7 spg. He’s the franchise’s all time leader in games played (807) and steals (1,360). In fairness, Barry would probably have the lead in steals, but steals were only tracked in the last four of his seven seasons with the Warriors. Nonetheless, Mullin handled his own business. Mullin ranks second in Warriors’ history in free throw percentage (862%; min. 250 attempts), third in 3-pointers made (590), fourth in points (16,235; 31 behind third place, 212 behind second) and assists (3,146), and for good measure, is seventh in franchise history with 488 blocks. Given the abundance of talent at the other positions, the Warriors’ power forward spot is somewhat underwhelming. Two seasons from a Hall-of-Famer, a surprisingly good two and a half from a future #1 overall bust and a pair of solid, unsung bangers. You could make a case for any of the four, and I wouldn’t argue too vehemently. All-timer Jerry Lucas averaged an excellent 17.5 ppg and 15.2 rpg in 143 games over two seasons, but simply did not wear a Warriors jersey long enough or play for any memorable teams. In 1970-71, however, Lucas did put up arguably the best season ever by a Warriors PF, when he averaged 19.2 ppg and 15.8 rpg and was named an All-Star. Had Lucas spent another season or two in the Bay Area, this spot would have been his. This spot could have gone to Joe Smith, simply because someone ought to remember him for actually having a couple of decent seasons to start his NBA career. The top pick in the 1995 draft, Smith stepped into the NBA as a solid contributor, playing in all 82 games as a rookie and averaging 15.3 ppg and 8.7 rpg. That effort was good enough to secure him a spot on the All-Rookie First Team and second place in the Rookie of the Year voting. In his second season, Smith improved on his performance as a rookie, scoring 18..7 ppg and grabbing 8.5 rpg in 80 games. He was traded to the Philadelphia 76ers 49 games into his third season, while averaging 17.3 ppg and 6.9 rpg. Following that season, Smith would go 11 years before averaging more than 14- 8 again. Speaking of which, did you realize that Joe Smith played in 81 games last season and averaged 15.7 ppg and 8.7 rpg? Not bad for a 14th year bust! Also receiving consideration was Larry Smith, one of the best rebounders of the 1980s and the man who played more games at PF than any other Warriors’ player. In 617games with Warriors, Smith averaged 8.5 ppg and 10.4 rpg. In nine seasons, Smith never averaged worse than 8.2 rpg, and on five occasions was good for at least 10.9 rpg. He enjoyed his best season in 1984-85, when he averaged 11.1 ppg and 10.9 rpg. However, in the end, this spot went to Clyde Lee, the Warriors’ rebounding specialist for eight seasons in the 1960s and 1970s. In 583 games with the team, Lee averaged 8.5 ppg and 11 rpg. Five times he averaged 11+ rpg and in three consecutive seasons (1967-68 through 1969-70) averaged a double-double. This includes the best all-around season of his career, 1967-68, during which he averaged 11.9 ppg and 13.9 rpg, and was named an All-Star. Lee was also a solid playoff performer for the Warriors, who reached the postseason in six of his eight seasons. The team appeared in the NBA Finals his rookie year and reached the conference finals in 1968 and 1973. After playing a limited role as a rookie, Lee was excellent in each of the latter appearances. In 1968, he averaged 11.4 ppg and 13.2 rpg in ten postseason games. In 11 playoff games in 1973, Lee scored 10.6 ppg (up from 6.3 in the regular season) and grabbed an outstanding 15.7 rpg (up from 9.1) as the Warriors knocked off Kareem’s Milwaukee Bucks before falling to the Lakers in the conference finals. Unfortunately for Clyde Lee, while he did enjoy some team success with the Warriors, he was traded to the Atlanta Hawks in the summer of 1974… just in time to miss the championship run of 1974-75. A staggering compilation of talent and achievement. Five big men- four of them Hall-of-Famers- have put up outstanding numbers in a Warriors’ uniform. Joe Barry Carroll is the member of this group that’s not in the Hall, but scored 20.4 ppg (second among Warriors’ centers), 8.3 rpg and 1.7 bpg in 491 games. Joe may have been accused of “barely caring,” but he could flat out play. After an awesome collegiate career, Carroll was the top pick of the 1980 draft. As a rookie, he averaged 18.9 ppg and 9.3 rpg and was selected to the All Rookie First-Team. He broke out in 1982-83, averaging a career best 24.1 ppg and grabbing 8.7 rpg. He followed this up with a 20 ppg and 8 rpg in 1983-84. After a year away (more on this in a sec), he returned to the NBA in 1985-86, averaged 21.2 ppg in each of the next two seasons, and earned his only career All-Star selection in 1987. Carroll didn’t play in the NBA in the 1984-85 season, not because of injury or suspension, but because he opted to spend the season playing in Italy. This decision was not popular and attracted plenty of media ridicule. As usual, the media in its infinite wisdom was dead on. Why would a well-to-do 26 year-old want to spend one of his prime years plying his trade in a beautiful, foreign land? What a loser! Now, on to the Hall of Fame parade, kicked off by a young Robert Parish. Before establishing himself as a perennial All-Star and actually building the HOF resume in Boston, the Chief spent four seasons in Oakland, where he started to become one of the league’s better young bigs. In limited minutes, Parish was only good for 9.1 ppg and 7.1 rpg as a rookie in 1976-77, and 12.5- 8.3 in his second season. However, as Parish began to receive consistent minutes (2,100+ each of last two seasons), his scoring climbed to over 17 ppg, and he emerged as a top-flight rebounder, averaging 12.1 and 10.9 rpg in his last two seasons as a Warrior. Parish was traded to the Celtics in the summer of 1980, along with a draft pick that would become fellow Hall of Famer Kevin McHale, in exchange for the rights to the aforementioned Joe Barry Carroll. Next, we go back in time, to the early of not only the Warriors’ franchise, but the NBA itself, to examine the work of Neil Johnston. Johnston spent his entire eight-year career (1951-59) with the Philadelphia Warriors. He averaged roughly 6 ppg and 5 rpg in his first NBA season as well as his last, with half a dozen seasons of 19.5+ ppg (22+ five times) and 11.1+ rpg sandwiched in between. Johnston led the NBA in scoring for three straight years (1952-53- 1954-55, averaged 22.3, 24.4 and 22.7 ppg), topped the NBA in FG percentage three times (to give you an idea of the era, he didn’t top 50% in any of three seasons) and led the league in rebounding (15.1 rpg) in 1954-55. In each of the six prime seasons of his career, Johnston was named an All-Star. He earned four straight All-NBA First Team selections from 1952-53- 1955-56, and a Second Team nod in 1956-57. Neil Johnston was also a central figure in the Warriors’ 1955-56 title team, which captured the second of the franchise’s three championships. Johnston was vital in the team’s run to the title, averaging 20.3 ppg and 14.3 rpg in ten postseason games. Those three (particularly Johnston) were pretty good, but now… on to the big guys! First up, Nate Thurmond, one of the greatest big men ever at both ends of the floor. In eleven seasons with the Warriors, Thurmond averaged better than 16.1 rebounds eight times, including a six-year run of 17.7+ rpg, and twice averaged better than 21 rpg. He scored 16+ ppg in nine straight seasons, including five straight years of 20+. Thurmond was named to the All-Rookie team in 1964, earned seven All-Star selections, five times was named to the All Defensive Second or Third Team and was named one of the NBA’s 50 Greatest Players in 1996. Twice in the 1960s- 1964 and 1967- Thurmond’s Warriors reached the NBA Finals. Thurmond was a rookie the first time, averaging a solid 10 ppg and 12.3 rpg. Three years later, as the focal point of the 1967 Finals team, Thurmond averaged 15.9 ppg and was a monster on the glass, grabbing 23.1 rpg in 15 postseason games. Thurmond produced a pair of other outstanding postseason performances. In 1969, he averaged 16.7- 19.5, and in, when he posted an incredible 25.4- 17.8. Sadly, much of Nate Thurmond’s incredible work has gone overlooked- or at least underappreciated- thanks to the legendary exploits of his contemporaries. The early and middle part of his career was spend battling Russell and Wilt during their respective primes, with Kareem and more Wilt (the Laker version) standing in Nate’s way in his later years. As great as he was at his best, Thurmond was never named All-NBA First Team or All-Defensive First Team. Not only is this not a travesty, there’s not even a case to be made for Thurmond. The aforementioned four playoff runs? Downed in the Finals by Russell (1964) and Wilt (1967), Wilt again (this time with the Lakers in 1969) and a young Kareem in 1972. The three greatest centers in the history of the game repeatedly prevented Thurmond from adding to his legend. Thurmond’s last season with the Warriors was 1973-74, after which he was traded to the Bulls, where he began playing out the waning days of his career. He started his run in the Windy City with a bang, recording the NBA’s first-ever quadruple-double (22 points, 14 rebounds, 13 assists and 12 blocks) in his first game with the Bulls. Cool, huh? Yeah, until you consider that he wound up the season averaging 7.9 ppg and 11.3 rpg, while Rick Barry led his former team to the 1974-75 NBA title. If we had to identify a theme for Nate Thurmond’s career, “Hard Luck All-Timer” might fit. And then there’s Wilt. The best of Wilt. Entire books could be written about Wilt’s time with the Warriors (hell, I think I’ve written an entire book here! ), but I’ll try to keep this short. Wilt Chamberlain spent the first five and a half seasons of his NBA career with the Philadelphia Warriors. In that time, he won an MVP award (as a rookie), was named All-NBA First Team four times and an All-Star in all five seasons. Twice he averaged 44.8 ppg or better, and his rebounding average never dipped below 22.3 rpg. His worst season with the Warriors (by some margin) was 1963-64, when he averaged 36.9 ppg and 22.3 rpg. It was with the Warriors that Wilt averaged 37.6 ppg and 27 rpg as a 23 year-old rookie. It was with the Warriors that he averaged his career high of 27.2 rpg in 1959-60- to go along with 38.4 ppg. 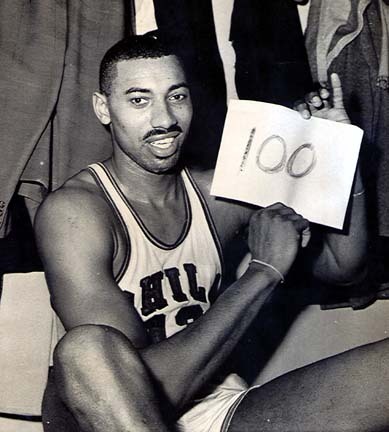 It was with the Warriors that Wilt dropped 100 on the Knicks in Hershey, PA. It was also with the Warriors that he averaged 50 per game, along with 25.7 rpg, that same season. When the Warriors moved from Philly to San Francisco in 1962, it was Wilt that made sure NBA hoops would be well-received by Bay Area fans, averaging 44.8 ppg and grabbing 24.3 rpg 1962-63 and leading the Warriors to the NBA Finals the following year. Wilt was traded back to Philly (to the 76ers) 38 games into the following season, while averaging 38.9 ppg and 23.5 rpg. Is it an indictment on the man’s personality and grasp of the team concept that a team could not refrain from trading him, even as he was making a statistical mockery of the sport? Sure- and it probably also explains why, for all the incredible numbers, Wilt didn’t reach the top of the NBA mountain in his days with the Warriors. However, with all of that said, Wilt was nothing short of a monster with the Warriors, where he reached the pinnacle of individual dominance in the NBA.